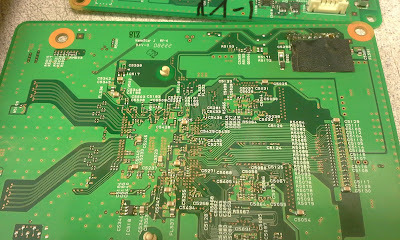 It's been a while since I blogged component level repair, so here's something. 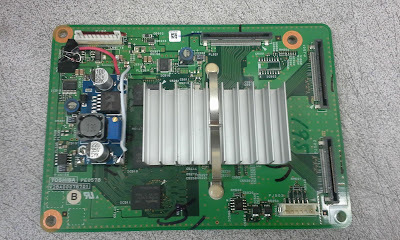 A customer brought a Toshiba 42XV540U LCD TV after we've serviced the power supply PE0580A for him. He said the TV started responding and clicking after our repair, but the display remained dark. We agreed on returning the money for the board repair and taking the TV instead as he said he didn't want to invest more time with it. Failure symptoms: TV responds to power on command, fans start turning and back light comes on (we could see from the back of the TV and a glow could be seen from the front, but only in a dark room). We could not make the TV output sound by blindly trying to change inputs; if you know how to do it perhaps you can do it , thus eliminating the main board as a top suspect. 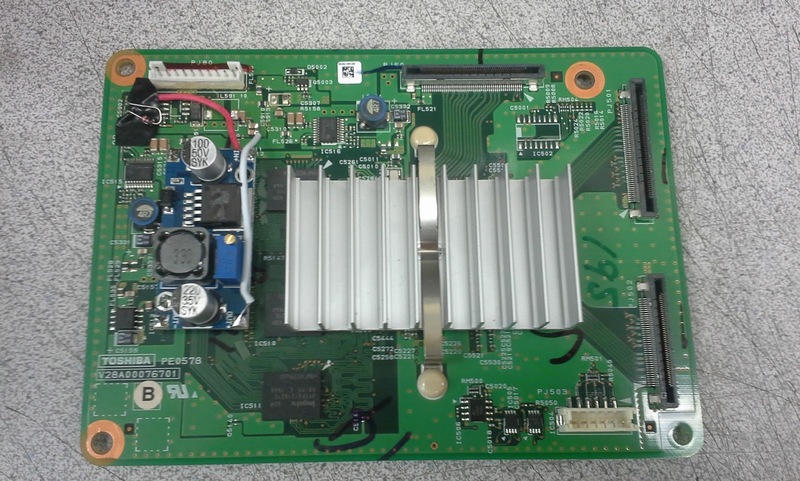 Solution: The TV was responsive to on and off commands, which suggests the main board was good. 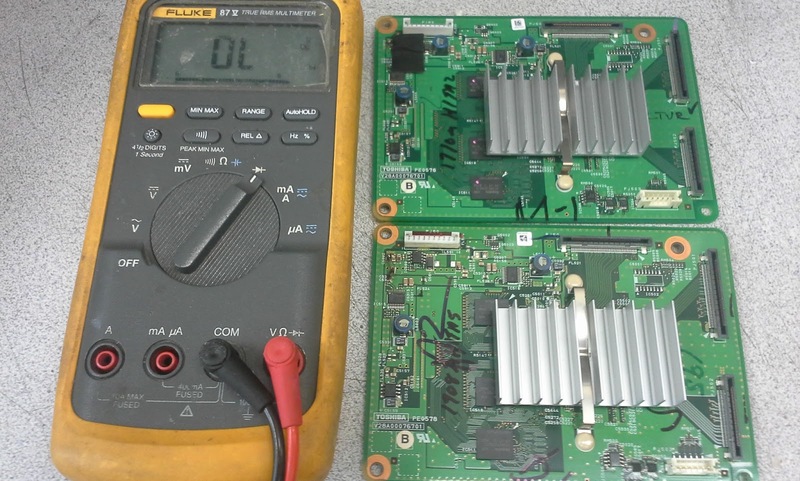 (failed main boards usually fail to do one or both of those operations). Plus backlight was coming up, which means the main board's processor was up and running to the point of activating the backlight. On the other hand we couldn't get sound out of it. 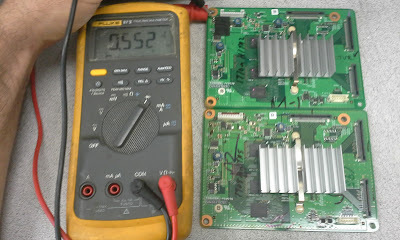 We checked the voltage going to the T-CON board and it was there - 12V DC. So the options were the main board (less likely), the T-CON or the video accelerator PE0578 (about equally likely) or the display itself (unlikely, it rarely ever fails to all dark screen). Luckily it turned out we had eBay listings for both the T-CON and the accelerator board. Testing with them it turned out the problem was in the accelerator board PE0578. Found the problem in the voltage stabilizer from 12V to 3.3V. 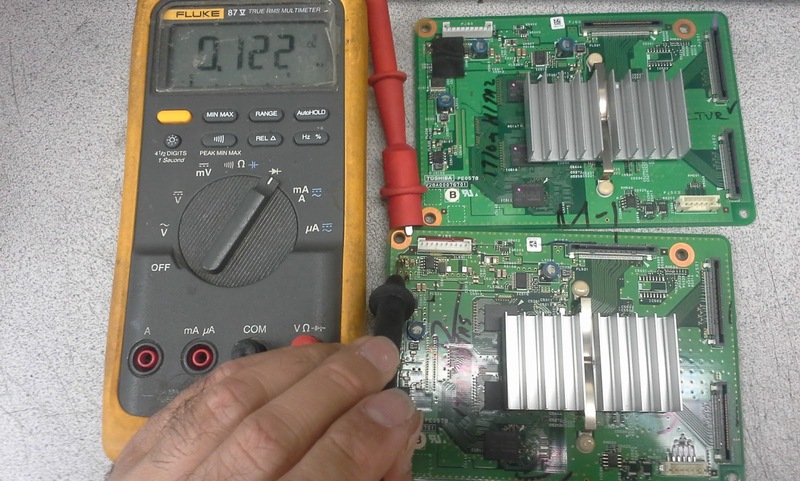 (The measurement can be made on several points and there are several components there that could be causing it; there were a few inductors we removed in order to eliminate the circuits after that as well as a few diodes that were in parallel and could have been causing the shortage). Used generic diode for replacement, such as the ones used in our repair kits for BN44-00161A power supply. Almost any diode will likely do, including even zener diodes (assuming it's properly soldered in regards to its polarity, of course). Long story short, we traced it down to the actual DC converter/stabilizer IC (AOZ1017AI). The solution worked out well and the TV is presently operational.